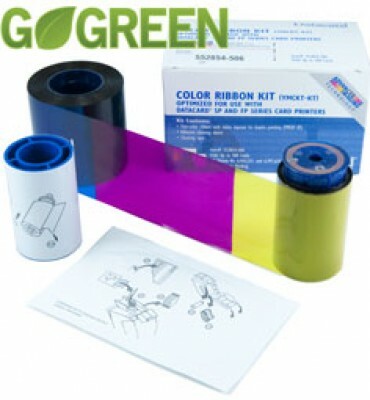 A Datacard Go Green 534000-006 ribbon kit has a YMCKT-KT full color printer ribbon. The ribbon has a printing capacity of 300 images per roll. The kit also includes an adhesive cleaning sleeve that picks up debris from cards before they are fed into the printing cycle and an isopropanol cleaning card, which is soaked in an alcohol-based solution to clean the inside of the printer. The ribbon in this kit is ideal for dual-sided printing, with the YMCKT panels for printing on the front side, and the second KT panels reserved for printing on the back side of the card. This ribbon works great with our Datacard SP75 printer. The printed cards look photorealistic. We always buy our ribbons and other ID supplies from these guys. They are professional, easy to deal with, have the best prices and they offer free shipping! It's not cheap but you get what you pay for -- premium and professional looking cards. This is a very reliable ribbon. We've been using it for over a year now and we rarely have misprints. If you own a datacard printer, you know their ribbons are great. The real gem here is ID Superstore. The customer service and attention to detail is unparalleled. Happy to do business with them and would recommend this vendor to anyone. Cards printed with this ribbon has a premium look and feel. We're very happy with the product.